Kalashnikov has decided to seek new markets with what the Russian media is dubbing a "flying car" - I think I saw this in cartoons when I was a kid in the Sixties. A video released by Kalashnikov shows there is surprisingly little to the "car"—there is no gasoline or diesel engine. Two banks of what appear to be batteries are located under the rider and likely provide electricity to the eight pairs of rotors. A shell or chassis is shown superimposed over the vehicle at the end. The program was, of course, Jonny Quest, one of my childhood faves. 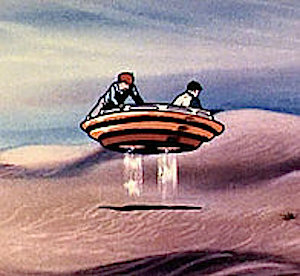 The hovercraft shown below made it into several episodes, and there were some variations on the idea in the show. Hovercraft of course appear in different guises elsewhere in science fiction, like the hovercraft from Mona Lisa Overdrive (1988) by William Gibson and the very fanciful Hawking mat from Hyperion (1989) by Dan Simmons. Do Russian engineers watch Jonny Quest? I'll bet they do.